Solar flares, cosmic radiation, and the northern lights are well-known phenomena. But exactly how their enormous energy arises is not as well understood. Now, physicists at Chalmers University of Technology, Sweden, have discovered a new way to study these spectacular space plasma phenomena in a laboratory environment. The results have been published in the renowned journal Nature Communications. “Scientists have been trying to bring these space phenomena down to earth for a decade. With our new method we can enter a new era, and investigate what was previously impossible to study. It will tell us more about how these events occur,” says Longqing Yi, researcher at the Department of Physics at Chalmers. The research concerns so-called ‘magnetic reconnection’ – the process which gives rise to these phenomena. Magnetic reconnection causes sudden conversion of energy stored in the magnetic field into heat and kinetic energy. This happens when two plasmas with anti-parallel magnetic fields are pushed together, and the magnetic field lines converge and reconnect. This interaction leads to violently accelerated plasma particles that can sometimes be seen with the naked eye – for example, during the northern lights. Magnetic reconnection in space can also influence us on earth. The creation of solar flares can interfere with communications satellites, and thus affect power grids, air traffic and telephony. In order to imitate and study these spectacular space plasma phenomena in the laboratory, you need a high-power laser, to create magnetic fields around a million times stronger than those found on the surface of the sun. 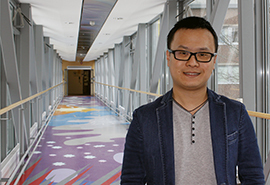 In the new scientific article, Longqing Yi, along with Professor Tünde Fülöp from the Department of Physics, proposed an experiment in which magnetic reconnection can be studied in a new, more precise way. Through the use of ‘grazing incidence’ of ultra-short laser pulses, the effect can be achieved without overheating the plasma. The process can thus be studied very cleanly, without the laser directly affecting the internal energy of the plasma. The proposed experiment would therefore allow us to seek answers to some of the most fundamental questions in astrophysics. “We hope that this can inspire many research groups to use our results. This is a great opportunity to look for knowledge that could be useful in a number of areas. For example, we need to better understand solar flares, which can interfere with important communication systems. 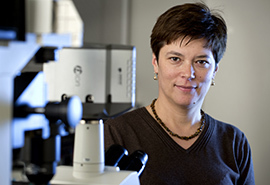 We also need to be able to control the instabilities caused by magnetic reconnection in fusion devices,” says Tünde Fülöp. The study on which the new results are based was financed by the Knut and Alice Wallenberg foundation, through the framework of the project ‘Plasma-based Compact Ion Sources’, and the ERC project ‘Running away and radiating’. Schematic of the proposed setup and relativistic jets generation. a A moderately high-intensity laser pulse (a0 = 5) propagates along the x-direction, and is splitted in half by a micro-sized plasma slab. 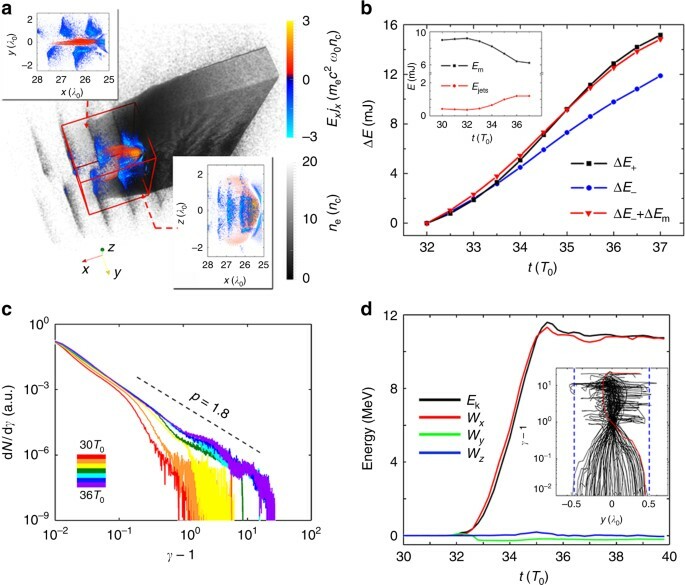 The laser drives two energetic electron beams on both sides of the plasma surfaces, which generate 100 MG level opposing azimuthal magnetic fields in the middle. 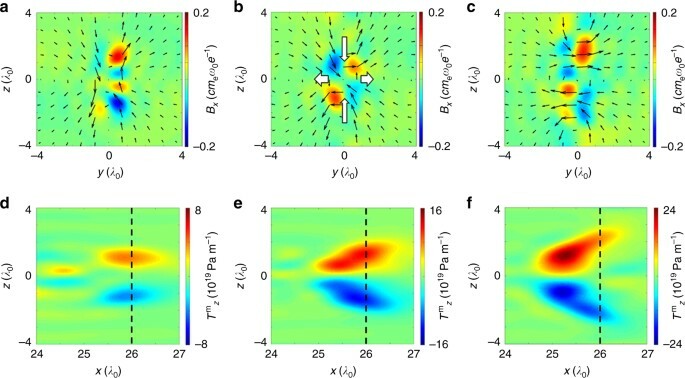 Ultrafast magnetic reconnection is observed as the electron beams approach the coronal region (the area within the blue box, where the plasma density decreases exponentially) at the end of the slab. The two insets below show the transverse magnetic fields (black arrows) and longitudinal electric current density (color) at the cross-section marked by the red rectangle (separated by 10λ0) at simulation times t = 24T0 and t = 34T0, respectively. b–e Generation and evolution of the relativistic jet resulting from MR at times 32T0, 35T0, 38T0, and 41T0, respectively. The rainbow color bar shows the transverse momentum P z of the jets formed by the background plasma electrons in b–e, and the blue-red color bar shows the energy of the electron bunch driven by the laser pulse in b, c.
Gyrotropy quantification at different times. Square root of quantified pressure tensor agyrotropy Q−−√ in the coronal plasma at simulation time t = 32T0(a), 33T0(b), and 34T0(c). The insets show the value of Q−−√ at the cross-section with longitudinal coordinate x = 26λ0, which is marked by the red rectangles in a–c. Evolution of magnetic fields and magnetic tension force during the reconnection. a–c Static magnetic fields (frequency below 0.8ω0) and d–f z-component of magnetic tension force at simulation time t = 32T0 (a, d), 33T0 (b, e), and 34T0 (c, f). In a–c the transverse (B y , B z ) and longitudinal (B x ) components of magnetic field are presented by the black arrows and color, respectively. The bold white arrows in b show the inflow (horizontal) and outflow (vertical) electric currents that result from Hall reconnection. The black-dashed lines in d–f mark the cross-section where the corresponding magnetic fields (a–c) are shown. Magnetic energy dissipation and the energization of non-thermal electrons. a Field dissipation (E x j x ) and electron density at t = 33T0 in the corona, the insets represent the top and side views of E x j x in the reconnection site (marked by the red box). b Time dependence of total energy increase in electrostatic fields, electrons in the corona, and protons (ΔE+), energy reduction of electromagnetic fields and other electrons (ΔE−), as well as the total energy reduction that includes magnetic field dissipation (ΔE− + ΔEm), inset shows the evolution of static magnetic energy Em and total kinetic energy of electron jets. c Coronal electron spectra from 30T0 to 36T0. d The temporal evolution of the kinetic energy (Ek) and the work done by each electric field component (W x , W y , and W z ) for one representative electron. The inset plane shows the phase-space trajectory (γ − 1 plotted vs. y) of the total 100 tracked electrons, where the blue-dashed line marks the boundary of plasma slab and the trajectory in red represents the case shown in d.
The University was founded in 1829 following a donation by William Chalmers, a director of the Swedish East India Company. He donated part of his fortune for the establishment of an “industrial school”. Chalmers was run as a private institution until 1937, when the institute became a state-owned university. In 1994, the school was incorporated as an aktiebolag under the control of the Swedish Government, the faculty and the Student Union. Chalmers is one of only three universities in Sweden which are named after a person, the other two being Karolinska Institutet and Linnaeus University.